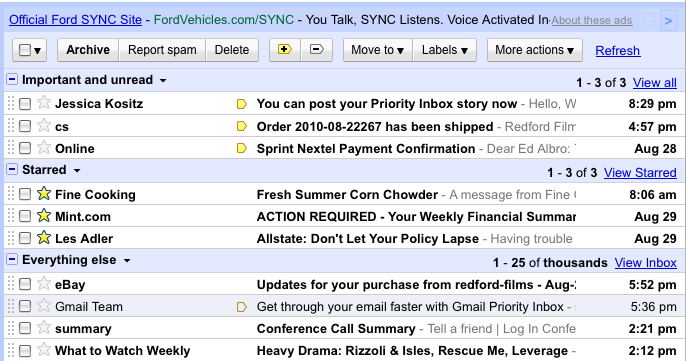 Google is tackling e-mail overload with a new Gmail feature called Priority Inbox. The new feature, which will be made available to all Gmail users, will sort your Gmail inbox into three sections ("Important and Unread," "Starred," and "Everything Else"), and will automatically drop messages into one of these sections based on the message's importance. The idea is that you'll be presented with your most important messages first, and won't have to waste time sorting through less-important communications first. Google calls Priority Inbox, which is still in beta, "an experimental new way of taking on information overload in Gmail." The idea is to filter out mail that falls somewhere in between spam and important mail; mail that's definitely not spam, but isn't terribly important, either. (Google calls this "bologna" or "bacn.") Google says Priority Inbox will allow Gmail to separate the bologna from the important mail. "In a way, Priority Inbox is like your personal assistant, helping you focus on the messages that matter without requiring you to set up complex rules," Doug Aberdeen, a Google software engineer, writes on Google's Gmail blog. Sounds good, right? E-mail is, after all, is something of a necessary evil. We can't go without it, yet it's one of the biggest time wasters around. Google says Priority Inbox can save you lots of time, noting that in internal tests at Google, people who used the feature spent about 6 percent less time managing e-mail. If you spend 13 hours per week on e-mail, that could add up to one whole work week saved every year. Again, it sounds good. Really good. But I'm not entirely convinced that Priority Inbox will be the best thing to happen to e-mail since a spam filter. Here's why. Google says that Priority Inbox will automatically flag some of your incoming messages as important, such as those from the people you e-mail the most. I did a quick scan of my Gmail inbox, and the people who e-mail me the most are not sending me the most important messages. Several of my friends' names show up quite frequently, and my husband's name is in there a lot, too. So is the name of my realtor, who sends me an automatic message at least once a day. None of these messages is truly important. I want to read all of them, but they all can wait until I have time to do so. What's more important -- most of the time -- is the communications I have with my editors here at PCWorld and at other publications. I don't e-mail my editors as often as I do my friends, but if a message arrives from an editor, it certainly takes priority over a string of messages between friends who are trying to make dinner plans. Priority Inbox seems to be emphasizing quantity over quality, and I'm not sure that makes sense. Google notes that you can, of course, help improve Priority Inbox's accuracy as you use it. It will place small plus and minus icons at the top of your inbox, which you can use to identify a conversation as important or unimportant. You also will be able to set up filters to mark specific messages as important or unimportant, which sounds like a great idea. (I already know a few senders who will land on that unimportant list!) You'll also be able to rearrange the three inbox sections, and can customize them to your liking. I'm not saying Priority Inbox is going to be the worst idea since, well, Google Buzz. I do think it has some potential. But I don't think it's going to revolutionize e-mail, either. I've yet to find an automated system that I really can rely on to make e-mail that much easier. I always find myself peeking in my spam folder to make sure it doesn't contain messages I'd actually want to read. And most of the time, it does. So I have a feeling that once I get Priority Inbox up and running, I'm going to be spending some time sorting through the messages it says are unimportant, just to make sure it's right. Priority Inbox will be rolled out to all Gmail users in the next week or so, Google says. You'll know it's been added to your account when you see a red link that says "New! Priority Inbox" in the upper right-hand side of your Gmail window, to the left of your user name. Once the link appears, you can click on it to activate Priority Inbox. Once you try it out, let me know what you think. I'll do the same.